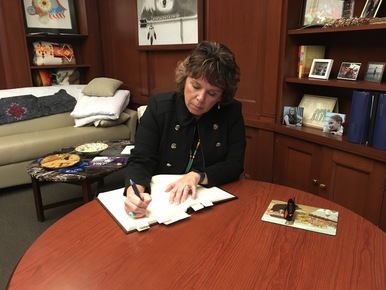 Justice Anne K. McKeig adds her signature to the interim attorney rolls. In our May issue, we wrote about how the practice of attorneys signing the attorney registration roll books was being revived for new attorneys. The attorney rolls were maintained from 1858 until 1983, when the practice was discontinued. Many attorneys who were licensed between October 1983 and May 2018 told us they wished they had been able to sign the rolls. We are delighted to announce that the Supreme Court has authorized the creation of interim attorney rolls, which will be kept at the State Law Library. If you were licensed in Minnesota between October 1983 and May 2018, we invite you to visit the State Law Library to sign the rolls! 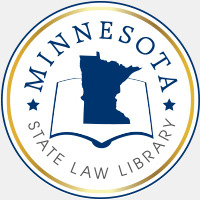 Members of the court and State Law Library staff will also bring the books when we visit areas outside the Twin Cities metro so attorneys in greater Minnesota have a chance to sign too. Please note that we encourage you to contact the State Law Library before planning a visit to ensure that the book for your year will be available. We hope to see you at the State Law Library soon! This month we're looking at helpful resources on criminal law. We already highlighted one of our favorite resources, the LexisNexis Practice Guide on Minnesota Criminal Law, in our August issue. Another great resource on criminal law is the Minnesota Judges Criminal Benchbook. This resource covers a criminal case from searches and seizures to post-conviction remedies and everything in between. You will find discussions of the applicable laws, along with practice tips, examples, and notes from practitioners and judges. We have two copies of this resource available at the State Law Library. For misdemeanor and traffic cases, Minnesota Misdemeanors: DWI, Traffic, Criminal, and Ordinance Offenses is a good place to start. This practitioner's guide offers step-by-step guidance on the procedure for handling misdemeanor cases. It also has chapters devoted to common offenses, such as DWI and implied consent, disorderly conduct, theft, and drug offenses. We have two copies of this resource available at the State Law Library. You probably think of statute books and legal treatises when you think of a law library, but our collection actually contains a lot more than that. Our Marvin R. Anderson Special Collections Room houses materials about early Minnesota legal history and court history, including several children's picture books written by members of the court and interviews with former judges and justices. We have recently added a circulating movie collection. Based on lists compiled by the editors of ABA Journal, we now have a number of popular movies depicting lawyers and life in the law. Did your favorite legal movie make the cut? Review 25 Greatest Legal Movies (2008), 25 Greatest Legal Movies (2018) and 25 More Great Movies to find out. ... that we have a guide specifically for attorneys? You will find resources to help you improve your writing, prepare for your first trial, develop your leadership skills, or start your own firm. Maintaining client funds properly is one of the most important aspects of a lawyer's practice, but attorneys are often unaware of all the best practices for trust accounts. To help attorneys avoid ethical issues involving trust accounts, the State Law Library recently hosted the CLE "Everything You Need to Know About Trust Accounts," presented by staff from the Lawyers Board of Professional Responsibility. We are delighted to make this program available as a free on-demand ethics CLE on our website. The Law Library recently published a new career book for retired Minnesota Supreme Court Chief Justice Russell A. Anderson. The career book covers Chief Justice Anderson's career and includes notable opinions, speeches, and rememberances. Justice G. Barry Anderson is the longest-tenured justice currently serving on the Minnesota Supreme Court. Recently, he sat down for an interview published in Bench & Bar of Minnesota. Read the full interview for Justice Anderson's thoughts on what it's like to be a Supreme Court Justice (and the Minnesota Vikings' Super Bowl chances). The Midterm Elections took place on November 6, 2018, and judicial officers from the Supreme Court, Court of Appeals, and District Courts were on the ballot. The Secretary of State's website has the full results for all judicial races. Room G25, Minnesota Judicial Center, 25 Rev. Dr. Martin Luther King Jr. Blvd.